This LiveNoise monitor is fitted with a low cost microphone. While it gives an accurate measurement of the relative sound level, it is not intended for applications that need a monitor meeting standards such as IEC 61672 and ANSI S1.4. Please see our other noise monitors for these applications. The LNT-M is ideal for monitoring long term relative noise levels and warning when levels go unexpectedly high. 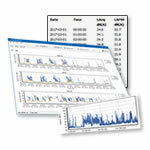 A typical application would be monitoring for high pressure steam leaks in an industrial environment. 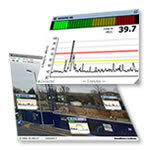 It is also ideal for monitoring the noise levels in open plan offices. A mixed system including this low cost version along with the LNT-320 or LNT-EAR noise monitors can be used to monitor larger areas with additional accuracy at key locations. The noise monitor can communicate continuously with the LiveNoise Supervisor software to provide real-time noise levels, long-term stored noise measurements and high-noise alarms. The LiveNoise Reporter software can generate long term reports. Alternatively, you can use the Web Reporter for online noise reports. An HDMI monitor can be connected to provide a large display of sound levels. The display can even be an old VGA monitor that you have hanging around, but you will need an HDMI to VGA adapter. 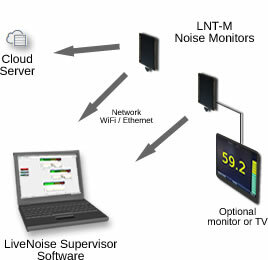 Installation of the LNT-M Noise Monitor consists of choosing the location that you want to monitor, ensuring power is available and selecting whether to connect to your network by WiFi or wired Ethernet. The LNT-M benefits from being wall mounted, but it can just be placed on a shelf or desk, laid flat. 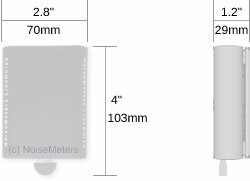 As the microphone is small and plugs directly into the unit (can be seen at the bottom of the box in the images), there is only one wire to connect up for power. The system requires 5V DC, which is provided by the power adapter that is included. It should be mounted close to a power outlet. As this device is powered by 5V, it is possible to power it from a computer's USB port, as long as it is able to supply the max 12W required. Communication will not be carried out over the USB port, just power. The LiveNoise Terminal is mounted using two screws or can just sit on a shelf or other suitable surface. If a more secure mounting method is needed then an additional security bracket is available. Please contact us for more information. The LNT-M can communicate with the LiveNoise Supervisor software to provide a real-time display of sound levels and for long-term noise measurement storage. With the Supervisor software running on a computer on your network, the LiveNoise Terminal just needs access to the same network.